"In relying on text as the primary means of formulating understanding, what stands outside its linear structure is dismissed... The visual provides expression where words fail. What have we been missing? And what can be made visible when we work in a form that is not only about, but is also the thing itself." I do feel a bit of envy as well as concern when I see a great visual illustration, especially when it is something extraordinary. The envy is self-explanatory, but the concern stems from imagining how long the artist must have spent on it, labouring away. The concern always eventually gives way to respect. I believe illustrators are a blessing and it's awesome when it's not just dead dudes getting praised for great works of art. Echo Gear #1, a graphic novel by Vincent Sammy, is an example of this. Though the words in the book are scanty and the flow sounds like a stream of consciousness poetry, the illustrations are some of the best I have ever seen in recent times - the dark, pencil-line sketches are smoothed and detailed, illustrating landscapes and pensive faces. The dark pencil style of Vincent Sammy is expressive, haunting and commands reflection. Such is its power that I spent time on the drawings on each page, trying to decode their meanings and enjoy what they have to offer. 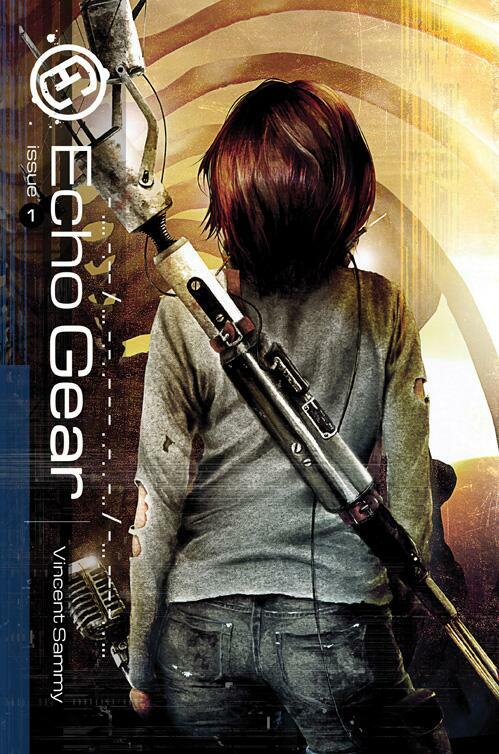 Echo Gear is a mash up of imagery, text, sequential art, editorial and advertorial nodes. It is a story told in codes, puzzles, wordplay, and cross-referenced archaic media. Great book illustrations make you relax into a book. It feeds your excitement and makes you feel like you've just seen a long lost friend. Some hold you spellbound, giving more dimension to whatever story you are reading. Words can sometimes restrict the imagination, mapping out a linear dream for your mind to follow, but a good drawing opens your mind to a more expansive interpretation and can give you more freedom to think outside of the box. As part of the western society that espouses the supremacy of words over images, I am trying hard to pull away from that mentality. I have read a few inspirational paragraphs this year, but I have seen equally powerful design concepts that have changed the way I think and, more importantly, stayed in my memory for longer. It is difficult to forget an event or a picture that made a strong impression on you. Even words are meant to form images in your mind to construct understanding. That is why you remember images more consistently than words. When last did you pick up a book full of illustrations, read a graphic novel or visit an art gallery? Try giving one of these a chance in the coming months.